Clear Creek Vehicles of Springfield is the leader in fleet golf cars sales and leasing. We start with the best golf car made and we follow that up with the best service after the sale. In the Springfield-Branson-Lake of the Ozarks area there are 37 golf courses and 31 of those golf courses choose to do their fleet golf car business with Clear Creek Vehicles. No other golf car supplier in the area has the facilities, the staff, and the overall resources that we have to offer. But it isn’t being the biggest that makes us the best; it is the personal attention we provide and our total dedication to each customer, big and small, that makes us the best. For us the ‘sale’ is just the beginning; we strive to make sure you are happy and profitable long after the sale is made. So whether you are looking for 5 golf cars or 100; whether you want new golf cars or used; whether you want to lease golf cars or purchase them; Clear Creek Vehicles is where you will get the best golf car, the best service, and the bestvalue. 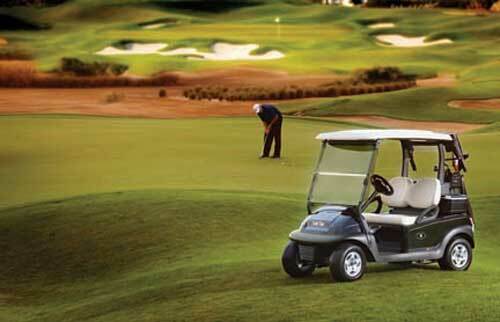 Club Car Golf Cars are the official golf car of the National Golf Course Owners Association. The NGCOA is far and away the industries leader in bringing golf course owners together to support one another. That support takes place in a number of ways from sharing ideas to joining forces to strengthen the position of the golf course owner. We have many facilities that are NGCOA members and the feedback we hear from them is very good. As a bonus, any non Club Car facility that switches to a fleet of Club Car Golf Cars is entitled to a sizable rebate from the NGCOA if they are members or if they become members.